The Guy Fawkes Mask: In V For Vendetta, A Metaphor for the Closet? Is the Guy Fawkes Mask a Metaphor for the Closet? 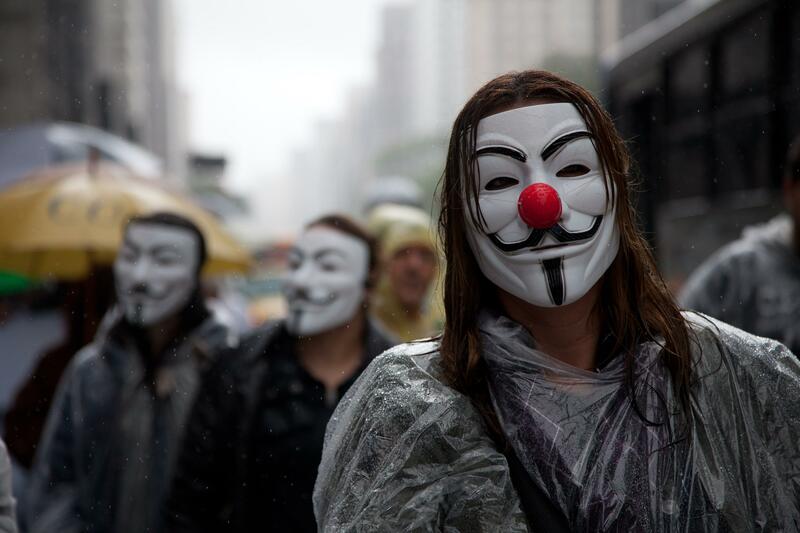 Demonstrators wearing Guy Fawkes masks in Sao Paulo, Brazil on November 15, 2011. This week in Slate, Rob Walker writes about the surprisingly recognizable branding of hacker group Anonymous. As Walker notes, the 4chan-based group’s public face has become the Guy Fawkes mask from V for Vendetta, which the hacktivists wear as a means of asserting their presence while preserving their anonymity. As the article details, Anonymous chose the mask in large part because “it’s available, it’s cheap, and it’s in every city.” Erstwhile Anonymous member Gregg Housh says that the actual Guy Fawkes had “nothing to do with it.” Even so, the mask’s association with the book and the film—in which protesters similarly use the mask to assemble in public and demonstrate anonymously—must have been attractive to some members. While Anonymous members might not be deadly revolutionaries like V, the masks resonate when protesters don them to rally against government corruption, as demonstrators have done at Occupy Wall Street. The mask represents the power of the people, and the power of uniting around an idea, whatever that idea may be. But in the film, at least, the mask also represents something else: being in the closet. I explain below, but first, a warning: There will be spoilers. While the film adaptation wants us to associate V with all of the citizens that he’s fighting for (he represents the power of the people, something reinforced by the film’s final image of thousands dressing like him in order to overthrow the government), it takes special pains to associate V with the film’s other gay heroes—especially Deitrich, whom the film parallels with V so closely that even Evey suspects that something is up. One morning, Deitrich makes Evey the same breakfast that V had made her (“eggie in the basket”), gives the same greeting in French (“bonjour mademoiselle”), and plays nearly the same music (each plays a different song by Antonio Carlos Jobim)—and the whole sequence is shot using the same camera angles in the same order. Evey: The first morning I was with him, he made me eggs just like this. Gordon: That is a strange coincidence. Although, there’s an obvious explanation. Gordon: Yes, Evey. I am V. At last you know the truth. You’re stunned, I know. It’s hard to believe isn’t it, that beneath this wrinkled, well-fed exterior there lies a dangerous killing machine with a fetish for Fawkesian masks. ¡Viva la revolución! Parallels with other characters are more subtle, but are there nonetheless. A lesbian character named Valerie is shown doing laundry on a steel washboard, while in a different scene (on Deitrich’s TV show, as it happens), V is shown (rather randomly) using the same washboard as a musical instrument. Valerie’s lover, Ruth, grows the same cultivar of roses (“Scarlet Carsons”) that V leaves with his victims. In the film’s final sequence, which crosscuts between the explosion of Parliament and London’s revolutionaries taking off their masks, five of the last six characters shown removing masks are gay—and all of them are dead. The larger point is that V represents the people (“He was all of us,” Evey says), but the film takes special pains to associate V with these victims in particular. It seems likely that the Wachowski siblings (who produced and wrote the adaptation) felt a personal connection to some of these themes in the graphic novel, and chose to expand on them in their adaptation. The Wachowskis have long shown interest in representing homosexual protagonists. Their debut film Bound was about two lesbian heroes, and was considered rather groundbreaking for mainstream Hollywood. According to Deadline, they’re also shopping around a screenplay for a “hard R gay love story.” The Wachowski sibling formerly known as Larry Wachowski is now known as Lana Wachowski, and is widely rumored to be a transsexual. It’s unclear what 4chan would think of this. The board may have united against homophobia in the past, but it’s far from politically correct. 4chan users label newcomers as “newfags,” and “-fag” is perhaps the most commonly used suffix on the board. If they’re wearing the mask of Hollywood’s first LGBT superhero, that really is a coincidence.